A large-scale rally against the reforms of French President Emmanuel Macron is being held in Paris on Thursday, a Sputnik correspondent reported. 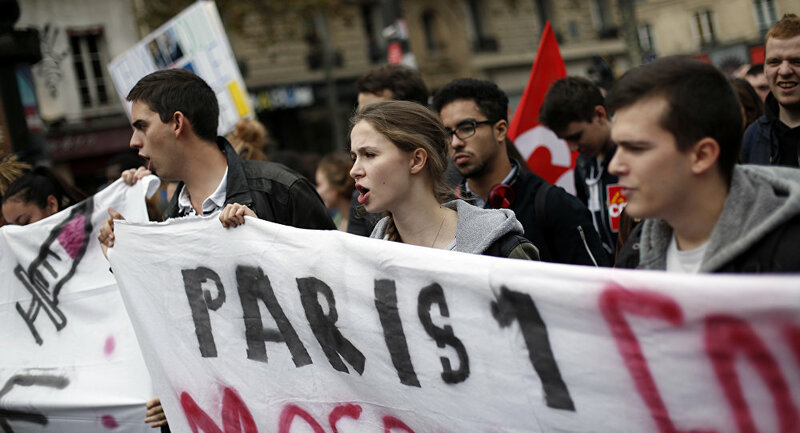 A procession, comprising members of several major French trade unions, as well as students and retirees, gathered at 2 p.m. local time (13:00 GMT) on Place de la Republique in downtown Paris. According to the Sputnik correspondent, thousands of people have gathered to protest. Reinforced police units have been deployed to the route of the procession, the correspondent indicated. Activists were reportedly carrying banners with the slogans "Macron — Enemy of People," "French President — President of Rich" and "Labor Reform — Hunger, Rice, Pasta." The rally participants expressed discontent with Macron's labor reform, health policy, medical services and other measures. "Since Macron became president, we have seen a series of ultra-liberal reforms, that destroy all our social achievements, which enabled our society to develop, improve the quality of our life and work, to increase life expectancy," a representative of the General Confederation of Labor, France's national trade union, said. In September, President Macron signed into law a labor reform bill which is aimed at boosting employment, but labor unions believe that it is detrimental to workers' rights. The new law allows business owners greater freedom in salary negotiations, which previously depended on union-set industry standards, and also makes dismissal easier.